Versatile– Jigsaw mats are extremely versatile; they provide an excellent grip and this minimises the chances of slipping and falling. This makes them an ideal flooring material for various settings such as gyms, fitness centres, physiotherapy centres, daycare centres, and indoor playgrounds for kids, homes, community centres and more. 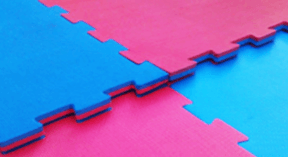 Perfect fit– When you look at high-grade EVA jigsaw mats such as the ones that we sell, you will find they are extremely well-designed and thick. The interlock design ensures they don’t move once they have been installed. Even if you have just 2-4 mats fixed in place, you will find they don’t move at all, unless you physically raise one and unlock it from the other. This shows that once you have installed the entire flooring, you will have a surface that won’t go anywhere and they become the perfect option for a gym or playroom. No tripping hazard– Because of their interlocking design, these jigsaw mats don’t easily rise up against the adjacent ones. This means as long as the installation is done skilfully and expertly, they will stay flat against the ground, provide a very solid surface to walk and exercise on and you don’t have to worry about any slipping or tripping. Aesthetically appealing– While these mats are available in standard black and grey colours, you can get, jigsaw mats in a range of vibrant and appealing colours. This gives you the flexibility to create the design impact you want in the indoor spaces of your establishment or home. It’s a great way to make the areas more eye-catching. In fact, this aspect makes them the preferred flooring option in day care centres and play areas for children. Resilience and durability– This is one more quality that makes jigsaw mats an excellent option in high-use areas like gyms. They are extremely resilient and the material has a natural bounce. And so, in case someone does fall down accidently, the mats will cushion the impact of the fall and reduce the chances of injury. This same quality also makes the mats extremely durable even under heavy use. Regardless of which way you look at it, you will find that EVA interlocking mats are the ideal option for various applications. You don’t need to look elsewhere for excellent quality jigsaw mats. We at Ezy Mats have a large collection of them. To know more, you can get in touch with us at (02) 97187424 or contact us through this form.